People deal with the pain of online hotel search is different ways. For many, it means spending hours and hours of research spread across dozens of browsers tabs. In my case, I usually throw up my hands and say, “Screw it, I give up, I’m just going to pick an affordable hotel that doesn’t look completely terrible.” Either way, there’s something broken here — the fact that without being there, it’s hard to tell what a hotel is really like. That’s what a startup called SimpleHoney is trying to solve. It was co-founded by Eric Nakagawa (a software developer who created the famous Icanhascheezburger blog) and Joyce Kim (a former corporate attorney who was previously CEO of Korean pop music site Soompi.com and is probably best-known to the startup community as co-host of the GigaOm Show). Kim, who’s the company’s CEO, walked me through the sign-up process: When you create a SimpleHoney account, you’re asked for some basic information about your travel preferences, and the site starts recommending hotels based on those preferences. You can also fill out a longer quiz, answering questions like what you prefer to do on vacations and how long your trips normally last. Then you’ll be assigned a travel personality type (if you’ve ever taken a personality quiz on a dating site, this will be kind of familiar), which is used to refine the recommendations. In other words, you’re no longer choosing a hotel based solely on the price and a star rating, but on how it actually fits with your personality and preferences. 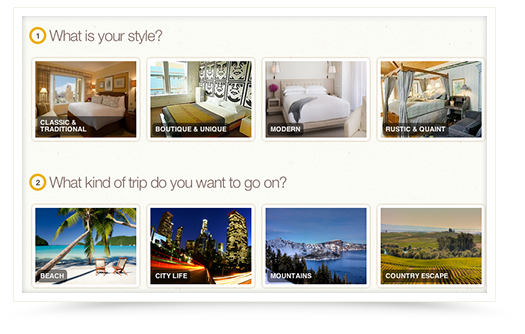 (And since SimpleHoney stores your personality data, you won’t be starting from scratch the next time you plan a trip.) Behind the scenes, the SimpleHoney team is doing a lot of footwork to make sure the hotel recommendations are accurate, including interviewing the management and visiting the locations. If you think of yourself as someone who doesn’t have travel preferences, well, so did I, but as I filled out the survey, it backed up what Kim was telling me: “People don’t realize they have a travel style until they go through this.” You may not care about staying in the fanciest hotels, but there’s probably something that matters to you, even if it’s having the cheapest and most convenient experience. One thing you may have noticed was missing from the description: Any information about where you’re traveling. That’s because SimpleHoney is a bit limited right now — it’s only listing hotels in San Francisco (where the company is based) and Hawaii (where Nakagawa is from, and where the team retreated to build the first version of the product). Also, the website doesn’t support bookings yet, instead pointing you to the hotels’ websites. That’s going to change this summer, first with the launch of booking capabilities, then with expansion to new markets. Looking further down the road, Kim says SimpleHoney can also allow hotels to target deals based on user interests. For example, she’s a big surfer, so a hotel could try to lure her by offering free surfboard rentals. Another possibility she mentioned is collaborative trip planning, where you and your travel buddies get group recommendations based on everyone’s preferences. If you’re interested in the idea but plan to wait until there are more features, you should still sign up now — SimpleHoney says it will charge a one-time $100 membership fee (because members will have access to unique “amenities, perks, experiences and rates”), but it’s waiving the fee for early users. The company has raised a seed round from Socialcast and About.me co-founder Tim Young, Mochi Media co-founders Jameson Hsu and Bob Ippolito, former Middleware Company CEO Ed Roman, Causecast founder Ryan Scott, and 500 Startups’ Dave McClure. Nakagawa and Kim also invested.